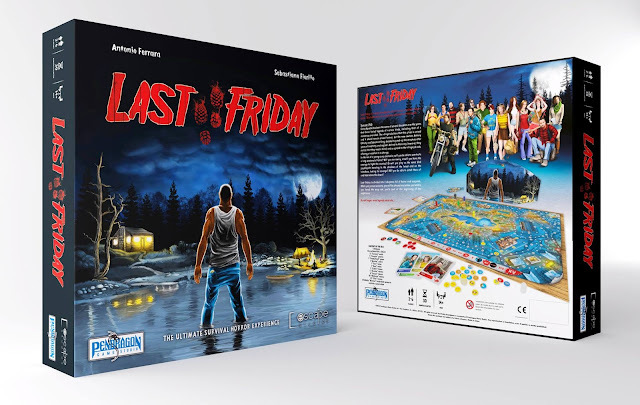 A few weeks back we brought news of an awesome looking board game titled Last Friday that has an 80's camp set them in the vein of Friday The 13th which has players trying to elude a killer lurking in the woods. Antonio Ferrara and Sebastian Fiorillo of Escape Studios created the game and plan to release it sometime later this year in Italy, but when we wrote about the game earlier this month, plans for an English language release were uncertain. That has now changed, as we have been informed that Last Friday has a new partner and a U.S. release date! Ares Games has partnered with Pendragon Games to publish and distribute worldwide the English edition of Last Friday. The expected release of the game is August 2016. For more information about this fun and exciting board game, please read on in the Press Release that was sent to us and we will be sure to keep everyone updated on any new updates as the release comes near. January 27, 2016 – Ares Games and Pendragon Game Studio announce a partnership to release the survival horror board game Last Friday to the English worldwide market. Created by Escape Studios and published worldwide by Pendragon, Last Friday is the first co-operation between Ares and Pendragon. Ares Games will produce and distribute the English version of the game and distribute it worldwide. Last Friday is a hidden movement, hunt and deduction board game, inspired by the popular “slasher” horror movie genre. Last Friday is about the story of a murderer who died and rose again. In the role of young campers, the players are challenged to survive a long weekend of terror – while one of them takes the role of the undying psychopath hiding in the shadows of the forest. Designed by Antonio Ferrara and Sebastiano Fiorillo (authors of the horror-themed card game“Stay Away!”), Last Friday is a game for 2 to 6 players, divided into 4 chapters full of horror and suspense (Arrival at the Camp, The Chase, The Massacre and The Final Chapter). Each chapter plays out very differently, as the hunter becomes the prey, then comes back from the dead looking for revenge. “We are proud to announce the partnership with Pendragon and Escape Studios to publish the English edition of Last Friday. It’s a very fun and tense game, with an original gameplay that allows players to plunge in the suspense of its horror setting. It will be a great addition to our games range,” says Roberto Di Meglio, Director of R&D of Ares Games. “We have been friends with Ares Games' team for years and finally we found a great opportunity to work together making this interesting project a success all over the world,” declares Silvio Negri-Clementi, President of Pendragon Game Studio. The English edition of Last Friday is expected to release in August 2016. For more information and to keep up to date about the game, visit Ares Games and Pendragon Game Studio, and follow the game’s page on Facebook - https://www.facebook.com/thelastfridayboardgame/. Pendragon Game Studio was born from a group of Italian hobby market professionals with more than two decades of experience, with the mission of creating new games for the international market and produce them in different languages through established partners. This long experience in publishing products such as books, magazines, newspapers, and games, as well as marketing them and working with game associations, gives Pendragon Game Studio complete knowledge of the hobby and how to produce and sell games in both national and international markets. In 2015, the first year of operation, Pendragon produced 6 brand new titles and made 3 localizations. See more info at www.pendragongamestudio.com/EN and follow us on Facebook at https://www.facebook.com/Pendragon-Game-Studio-534363276680250 and Twitter at https://twitter.com/GamePendragon. Ares Games is an Italian board game publisher established in 2011 to create quality hobby products for the international audience. Ares Games is the publisher of the award-winning "War of the Ring" board game, of "Wings of Glory" range of airplane combat games and miniatures, recreating aerial warfare in WW1 and WW2, and more recently, of the award-winning tactical ship-to-ship miniature game “Sails of Glory,” and the cooperative tactical Sci-Fi miniatures game “Galaxy Defenders.” Ares Games’ catalog also includes Family Games and Euro Games. For further information, visit the website www.aresgames.eu and the Facebook page - https://www.facebook.com/AresGames.